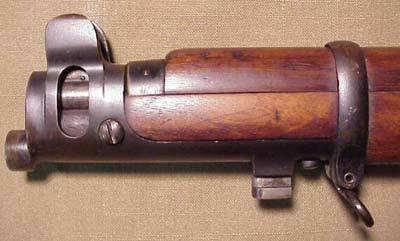 20000 Short Magazine Lee-Enfield Mk V were made for trails between 1922 and 1924. Approved in 1922, the No1 MkV was mainly crafted to improve upon the SMLE's accuracy. This issue was addressed by replacing the barrel mounted open rear sight with a receiver mounted aperture sight. Though some other minor adjustments were made, it was the aperture sight and longer sight radius that formed the basis for the trial. 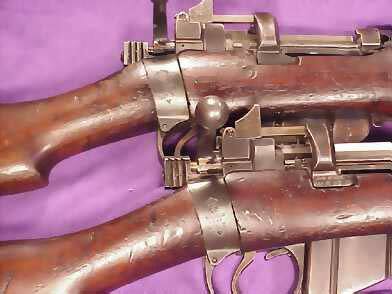 The MkV retained the appearance and general construction of the SMLE in most respects. The only noticeable changes were to its handguard arrangement, which compensated for the removal of the barrel mounted rear sight and the addition of the new aperture sight. 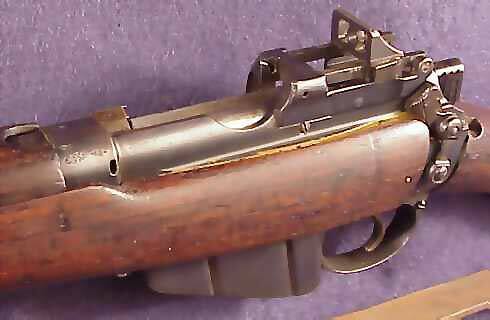 Somewhere in the War Office, it must have been thought that this rifle would be the last of the SMLE's. I assume this because of the number of rifles authorized for production, RSAF Enfield having manufactured 20,000 of them. It would seem to be an extraordinary number for a trial rifle. Despite these numbers and due to its limited success in solving the accuracy problem, combined with its labor intensive manufacturing process, the same process as the SMLE, the MkV was dropped in 1924. 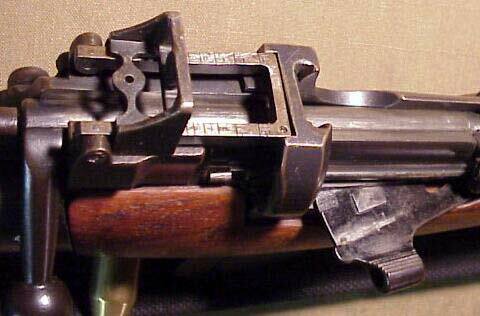 Early design aperture style receiver mounted "Battle Sight" & folding slide micrometer sight. Also note the magazine cut off. The distinctive nose cap of the MkV.